2. Rinse with cold water and drain well. 3. In a large bowl mix the bread crumbs, oregano, basil, and cooled pasta. Pour olive oil to your likening over the mixture. This recipe only contains 178 calories. As far as sugar, it is low in sugar, it only has 1.3g of sugar. It has 3.1 grams of fat which most likely comes from the oil. 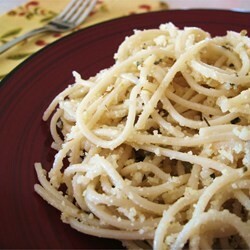 The recipe has 35mg of sodium which most likely comes from the pasta and the bread crumbs. Finally, it has 31.4g of carbs which comes from the pasta.